We wholeheartedly thank all our members who have joined this mission of learning the new recipes from all around the globe. 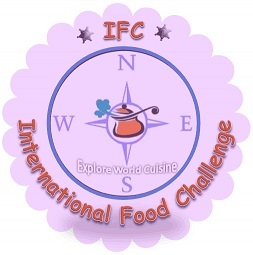 International food challenge is a group, started by two blogger friends Shobana(me) and Saras to learn the technique and different foods around the world. We surfed through several data on the world wide web and found Top 15 cuisine of the world. 15. Arab and others (which doesn't have a prominent cuisine to mention). Cantonese Cuisine, also named Yue Cuisine or Guangdong cuisine, is one of the main cuisine styles in China. It comes from Guangdong Province in southern China and it is one of among the eight great traditions of Chinese cuisine. 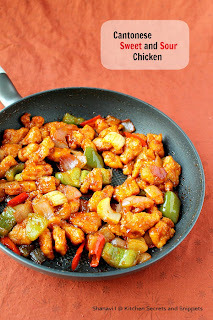 The basic cooking techniques of Cantonese cuisine include roasting, stir-frying, sautéing, deep-frying, braising, stewing and steaming. 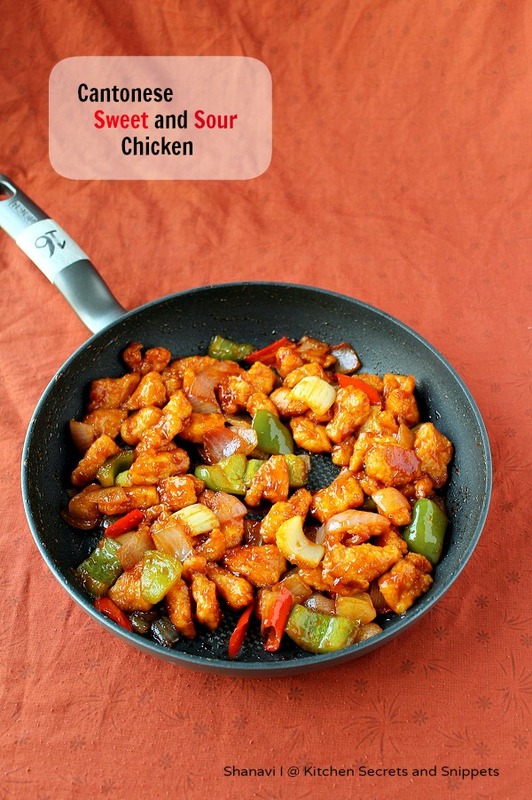 Steaming and stir-frying are most commonly used to preserve the ingredients' natural flavors. The most characteristic cooking methods of Cantonese Cuisine are cooking in salt, cooking in wine, baking in a pan. For this month, we both selected four recipes.. Lets get into one of the recipe of the challenge. 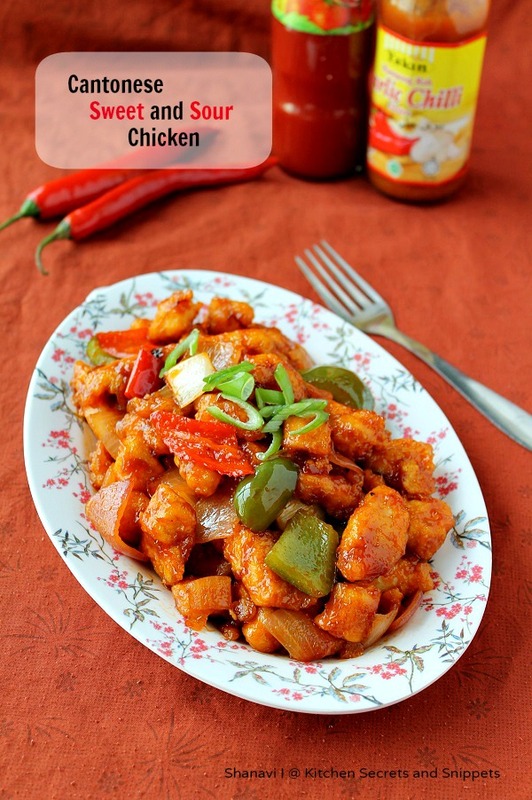 Veggie lovers, kindly substitute the chicken with tofu or paneer or soya nuggets. Rest of the instructions is same except the double frying. U just fry once for tofu/paneer. Add a tsp. of water if needed, I don’t think it will be necessary. Marinate the chicken with the above ingredients for about 10 minutes. Use your hands to mix well. Gather all the flour in a bowl and mix well. Set aside. Dice the veggie’s into ½” pieces. Set aside. Mix all the ingredients in a small saucepan and bring to a boil stirring well. Remove from heat and save in a bowl. Set aside. 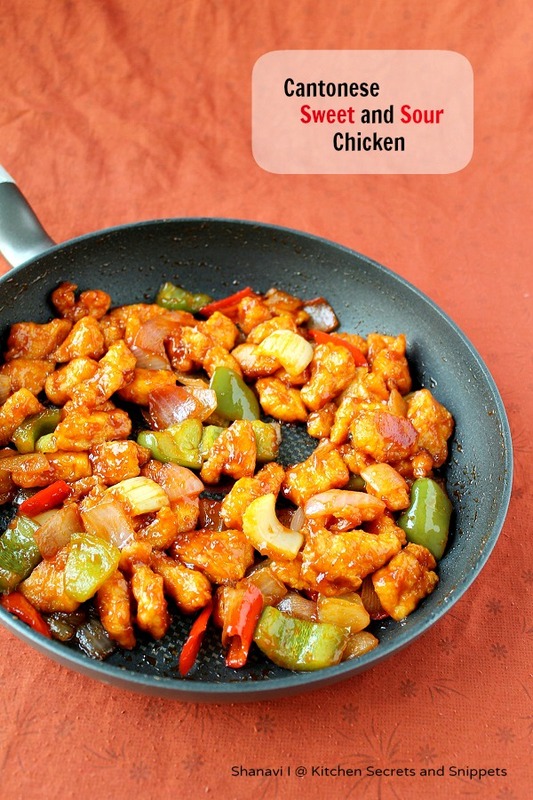 · Heat enough oil in a sauce pan to the medium heat and fry the marinated chicken in batches after dredging the chicken with the already prepared flour. i.e. Dip the chicken pieces in the flour, shake off the excess flour and deep fry until it is 50 % cooked, remove from the drain and drain on a kitchen tissue. Let them cool for 10 minutes. Again fry the half cooked chicken in batches until it is almost cooked, say for a minute. The texture should be crisp and light golden in colour. Cool the fried chicken for another 10 minutes or so. · Heat about 1 tbsp. of oil on a separate pan. Sauté the onion and red chilli peppers, cucumber, capsicum, until fragrant. Now pour in the prepared sweet and sour sauce earlier. Bring to a boil. Add the fried chicken, mix well to coat the chicken with the sauce evenly. Stir in the pineapple .Mix well to coat. Switch off and serve hot. Heat enough oil in a sauce pan to the medium heat and fry the marinated chicken in batches after dredging the chicken with the already prepared flour. i.e. Dip the chicken pieces in the flour, shake off the excess flour and deep fry until it is 50 % cooked, remove from the drain and drain on a kitchen tissue. Let them cool for 10 minutes. Again fry the half cooked chicken in batches until it is almost cooked, say for a minute. The texture should be crisp and light golden in colour. Cool the fried chicken for another 10 minutes or so. Heat about 1 tbsp. of oil on a separate pan. Sauté the onion and red chilli peppers, cucumber, capsicum, until fragrant. Now pour in the prepared sweet and sour sauce earlier. Bring to a boil. Add the fried chicken, mix well to coat the chicken with the sauce evenly. Stir in the pineapple .Mix well to coat. Switch off and serve hot. The colour of the dish itself is very pleasing and super tempting, seriously mouthwatering here.